Are the Sixers better when Robert Covington (33) hoists fewer shots? 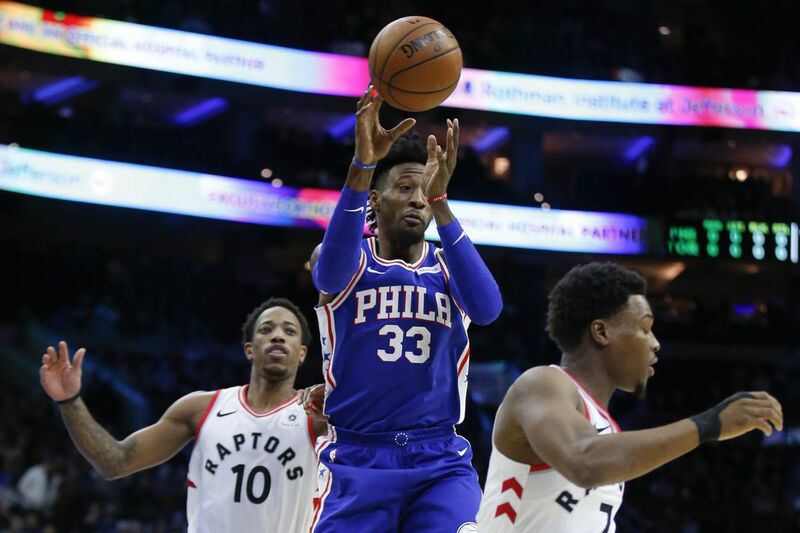 There was a moment Wednesday night when Robert Covington received a pass, set his feet, and bent his legs to begin his shot behind the arc on the left wing. But at the last second, he peeked at a closing defender and seemed to reconsider, passing the ball to the left corner. Back in October, one of the assumptions about the Sixers was that their revamped roster would allow Covington to slide into a role that allowed him to focus on defense, rebounding, and knocking down open threes. But as the season unfolded, Covington became more assertive in the offense. There was good reason for that: He knocked down 49 percent of his threes and shot 49.4 percent from the field in the team's first 15 games. But in the last 17 games, there has been a regression to the mean, with Covington shooting 31 percent from three and 36 percent from the field, meaning the career-high 11.4 shots he's attempting per game are no longer the picture of efficiency that they were in the season's opening month-and-a-half. His performance over the last five games would suggest that Covington has learned a little something, or been taught a little something. Whatever the case, it is working. As much value as Covington has brought to the Sixers since signing as an undrafted free agent, he remains an imperfect player who is very much an example of the Peter Principle in action. Look back at those splits, and look at them from this perspective: During those eight losses, nearly 10 Sixers' possessions per night ended on a Covington turnover or miss. Over the last five games, just 5.4 possessions ended that way. It isn't complicated. Of course, the Sixers need somebody to take shots. Before the season, the assumption was that Markelle Fultz would be one such guy. Against the Spurs, there were all kinds of moments that screamed for the kind of player the Sixers hoped they were getting when they traded up to No. 1 overall. With a little less than six minutes remaining and the Spurs having cut the Sixers' lead to 95-92, a particularly restless section of fans on the visitor's end of the court began to loudly implore somebody, anybody, to "TAKE … IT … TO … THE … HOOP!" It was a valid request. Covington, JJ Redick, Dario Saric: These aren't supposed to be players who are creating their own shots and opening up the offense for others. Redick, to his credit, has been much more impressive in that department than fans might have thought before watching him play every day. But the fact remains that asking them to create the shots they take is not the way to optimize their abilities. But, again, somebody has to do so. Ben Simmons and Joel Embiid are the obvious candidates, but the addition of a third player capable of creating and finishing consistently would help immensely in opening up the court. Late in the second quarter against the Spurs, Simmons had back-to-back possessions that resulted in weak, off-balance air balls. Embiid had a similar one in the second half. No doubt, some of that is the natural product of two young players with raw offensive games. Simmons' assertiveness down the stretch was notable. Despite his struggles from the free-throw line, and Spurs coach Gregg Popovich's decision to foul him when an opportunity presented itself, the rookie spent much of the second half of the fourth quarter obliging the home crowd and taking it to the hoop. "The thing that always attracted me to Ben Simmons was that when you went to his LSU numbers, he shot 10 free throws a game," coach Brett Brown said. "That's a big number in a 40-minute game. And tonight when you look down, he shot 15 free throws. That in itself is a huge win for me when he gets back to the line. It's a mentality more than it is a skill, and that mentality of him attacking the basket and going to the free-throw line, then growing the confidence that you're referring to — that's a hell of a package, and it starts with getting there." The notion that the Sixers have somehow found themselves after losing nine of 10 probably underestimates where they are as a team. The finding-out process could be a season-long thing, particularly with Markelle Fultz on the verge of return.